Sony SONMDRE10LPGRA Fashion earbud headphones feature 13.5mm driver units for less distortion when you crank the volume. Neodymium magnets for powerful bass and clear treble sound. Super light in-the-ear design provides for a comfortable snug fit. 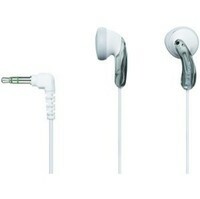 Earpiece Type: Earbuds; Earpiece Material: Plastic; Microphone: N/A; Headset Features: N/A.